Which Planets Have No Seasons? What Is the Wind Speed on Neptune? Earth's 23.4-degree axial tilt has a profound effect on climate, and with a tilt of 26.75 degrees, Saturn should experience similar climatic effects, but it doesn't. Instead of seasonal temperature variations and temperature differences between the poles, such as those that exist on Earth, Saturn's surface temperature changes little with latitude and from season to season. The reason is that most of Saturn's warmth comes from inside -- not from the sun. 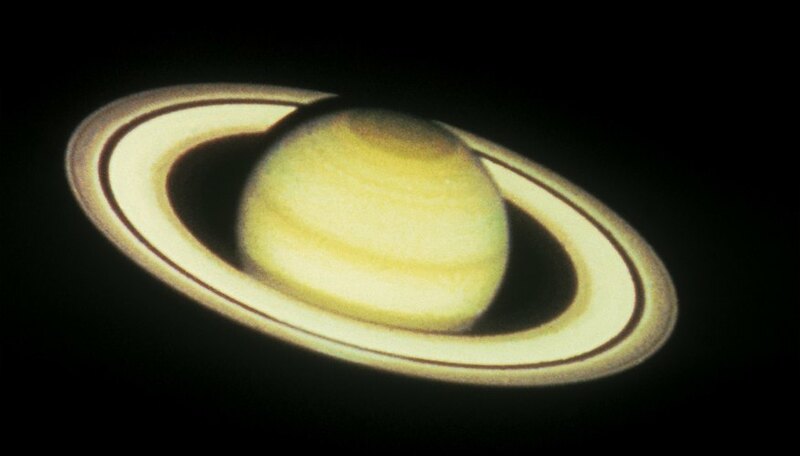 Saturn takes 29.45 Earth years to orbit the sun, making each of its seasons last a little longer than seven years. As each of its poles tilts away from the sun, and winter descends on that hemisphere, the atmosphere takes on a bluish tinge that NASA scientists think is ultraviolet sunlight reacting with stratospheric methane. At the same time, the bluish color gradually fades from the opposite hemisphere. These color variations, recorded in detail by the Cassini orbiter, can give the impression of seasonal temperature variations on the surface, but that impression is misleading. Saturn is a gaseous world and doesn't have a surface, but at the top level of its clouds, the temperature remains a steady minus 178 degrees Celsius (minus 288 degrees Fahrenheit) throughout the year. 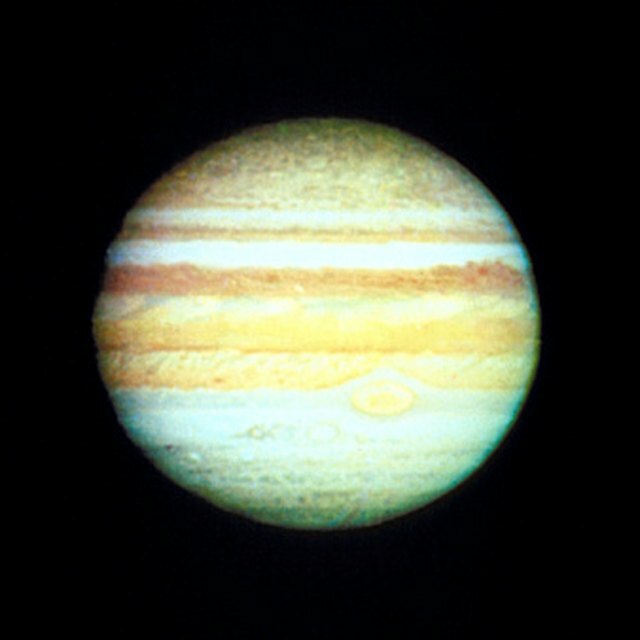 Horizontal variations exist, owing to high winds that blow at speeds as fast as 1,800 kilometers per hour (1,118 miles per hour), but the temperature varies little with latitude. In 2004, however, astronomers at the Keck Observatory in Hawaii discovered a vortex at the tip of the south pole with a temperature in the range of minus 122 degrees Celsius (minus 188 degrees Fahrenheit). Saturn radiates more than twice the energy it receives from the sun, which is the most of any planet in the solar system. Part of this comes from the heat generated at its core, where compressive forces generate temperatures around 11,700 degrees Celsius (21,000 degrees Fahrenheit). Saturn generates more heat than Jupiter, because it has cooled enough to allow helium to condense and rain out of its upper atmosphere. The helium droplets generate frictional heat as they fall through the hydrogen atmosphere. This phenomenon is responsible for the near-uniform temperatures on the planet's surface and the lack of seasonal differences. Saturn's polar hot spot is a phenomenon peculiar to that world. Earth, Jupiter, Venus and Mars all have polar vortices, but they are colder than their surroundings. Scientists aren't sure what causes it, but one suggestion is that particulate matter in the upper atmosphere traps ultraviolet sunlight, which would make the hot spot seasonal. This theory doesn't explain the concentration of the particles at the poles, however. Another possible influence on Saturn's surface temperature is a rain of charged water droplets from its rings. These interact with the ionosphere and cause shadows to form at specific latitudes. What Planet Radiates More Energy Into Space? Deziel, Chris. "Do Seasonal Temperatures Exist on Saturn?" Sciencing, https://sciencing.com/seasonal-temperatures-exist-saturn-22929.html. 25 April 2017.